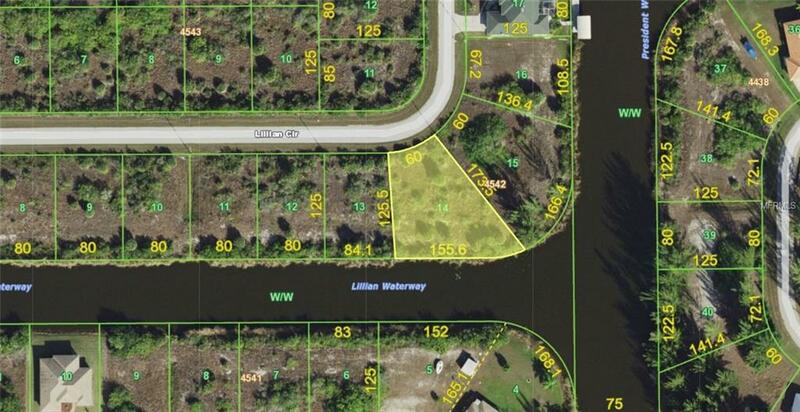 OVERSIZED TIP CANAL LOT IN SOUTH GULF COVE!! Over 50% more land than the ubiquitous 10,000 sq ft lots! Be the envy of your friends building your dream home on this extra special lot. There are not many of these lots that have the wider beautiful view down the canal. Being at the "tip" also gave it 155 feet of frontage which is almost double the typical 80 feet of frontage. South Gulf Cove boasts a wonderful community of newer homes with a park and a community boat launch for the lots that don't have their own canal adjacent like this one. The canals lead out to Charlotte Harbor and the Gulf beyond. There is a lock system in place that can be manually used. New construction is everywhere you look and you can be part of the action. Information about local builders is available upon request. Also great for self directed IRA's, 401k's and other investment portfolios.